Music has the ability to move people in ways that nearly nothing else can. It makes people happy when they're sad, it quickens the heart before a sporting event when somebody is getting pumped up and it can be a common denominator between two people who otherwise would have nothing in common. Music is also profoundly linked with personal memories, in fact, people's brains are hardwired to connect music with long-term memory. This is why when Fremont High School Senior Anya Morozov pitched her Youth Philanthropy Contest project idea in front of the Fremont Area Community Foundation in November 2015, they couldn't help but to make her one of the six recipients of a $1,000 grant. 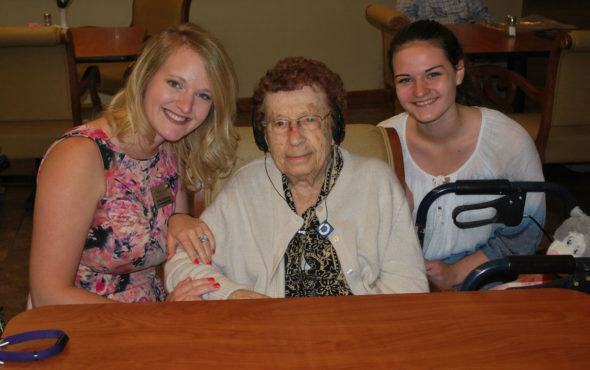 Morozovs project, run through the national organization Music & Memory, equipped 16 residents inside of The Heritage at Shalimar Gardensí Memory Support Building with their own IPods customized with their own playlists. Many listen to Elvis Presley, Big Band music, Glenn Miller and Johnny Cash, said Riley Faulkner, life enrichment director. While the patients can't always remember why they are listening to a particular song, it still gives them something personal that they enjoy. When first given the IPods, there were several visible reactions displayed by the recipients. We've had anything from tears, to lots and lots of laughs,î Faulkner said. ìIt was really cute, one of our patients, Alice, earlier this week she came out of her apartment listening to her IPod and she was dancing down the hallway. It about put us in tears; it was really great to see that from her. And positive reactions is what itís all about, in fact, itís why Morozov decided to pursue this route with her Youth Philanthropy grant. An accomplished musician herself, Morozov once played music for one of her mothers hospice patients she was treating. She was awed by the patients reaction when she started playing music for her. Me and one of my friends went to play violin and viola for one of my moms patients who had played violin in the past, Morozov said. ìIt was really moving she wasn't very responsive when we first got there, but once we started playing she started clapping along. After this encounter, Morozov watched a documentary on Netflix called ìAlive Inside,î which highlighted how Music & Memory uses IPods and personalized music to help people struggling with dementia and Alzheimers disease trigger memories. After receiving the FACF grant, $600 went toward faculty training ñ which about 30 people completed and the additional $400 went toward purchasing IPods. In April, a Music & Memory fundraiser was held which brought in an additional $2,000 used for other miscellaneous odds and ends. For Morozov, this might just be the start of big things to come. She isnít positive where she is going to college yet, but she knows she wants to study something that will lead her into more philanthropic work. Sparking young peoples ingenuity and creativity is the reason the Youth Philanthropy Contest started two years ago, said Melissa Diers, executive director of the Fremont Area Community Foundation. This is exactly what we had in mind when we started this,î Diers said. ìWe wanted to identify programs that could bring the concept of philanthropy down to earth a little bit. It doesn't require lots of money or time, it just requires some passion about how you can make your community and world a better place. Click here to be linked to the article on the Fremont Tribune website.